Donald Hamilton's Death of a Citizen was first published in paperback in the States by Gold Medal in 1960, although the edition seen above is the UK Coronet paperback from 1966, published, as was often the case with Coronet, to tie in to the novel's – also 1966 – movie adaptation. 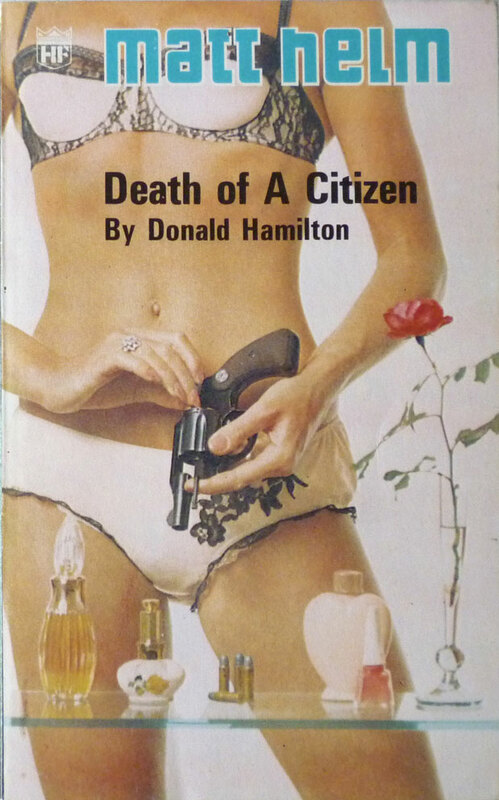 Death of a Citizen was far from Hamilton's first novel – he'd had around eight or so published prior to this one, a mixture of espionage, crime and suspense works, plus a handful Westerns, among them The Big Country (1958), which begat a famous film – but it was the first to feature the protagonist who would come to define him in most people's eyes: Matt Helm. When we initially meet Helm in Death of a Citizen, he's bringing his wife, Beth, a Martini at a suburban Santa Fe cocktail party thrown by their friends Amos and Fran Darrel. A man and a woman enter the house; the man Helm doesn't know, but the woman is Tina, a fellow World War II veteran (and occasional lover) whom Helm hasn't seen since the end of the conflict. During the war he and Tina worked for Mac, the head of a shadowy government espionage agency, carrying out a succession of deadly assignments, many involving assassination (Helm's codename, rather incongruously, was "Eric"). Their meeting again all these years later could, Helm reasons, be a coincidence... until, that is, Tina brushes her hair back from her ear – a signal to Helm, meaning: "I'll get in touch with you later. Stand by." 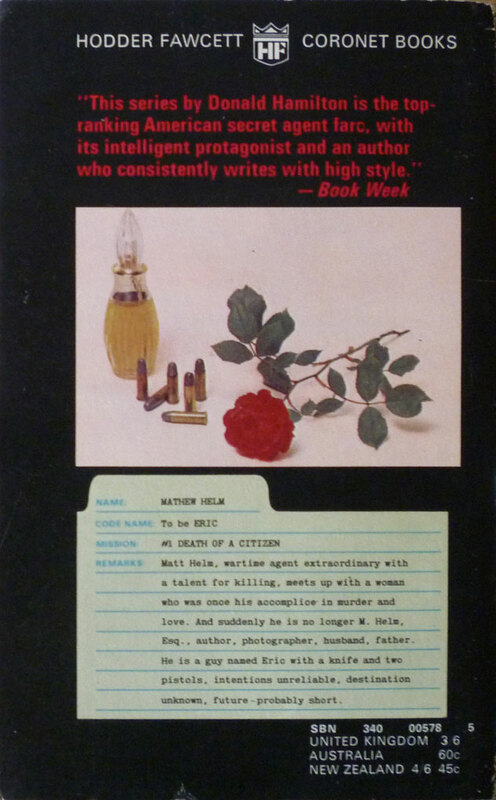 All of this is narrated by Helm, who we learn has left his violent wartime past behind him and settled into a comfortable middle-class way of life with a nice house, three kids, a loving wife and a career writing Western novels (shades of Hamilton himself there). But when, after leaving the party, Helm finds a body in his studio bathroom out back of his house, his cosy existence is shattered, and he heads out on the road with Tina in order to draw fire from Amos Darrel, who, as a noted physicist, has seemingly become the target of red agents. 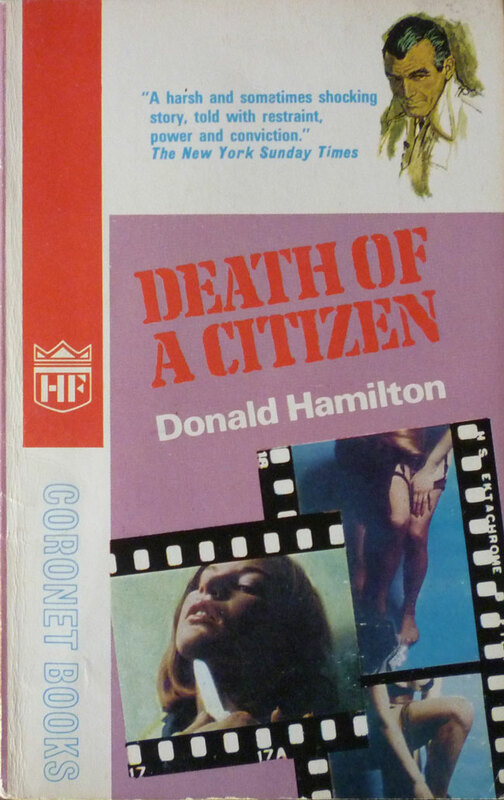 The juxtaposition of a standard American '60s suburbia with a savage form of counter-intelligence in Death of a Citizen is certainly jarring, and intentionally so. At the novel's outset, Matt Helm comes across as a fairly typical married white male; heading into middle-age – with attendant middle-aged spread – he glibly relates his passion for fishing and his postwar career as a photographer. But as Helm is drawn deeper into the kind of lethal game of espionage he thought he was finished with, his old instincts gradually re-emerge, along with an unexpected taste for danger. Helm begins to relish the excitement Tina's arrival has brought, and consequently does some highly questionable things. 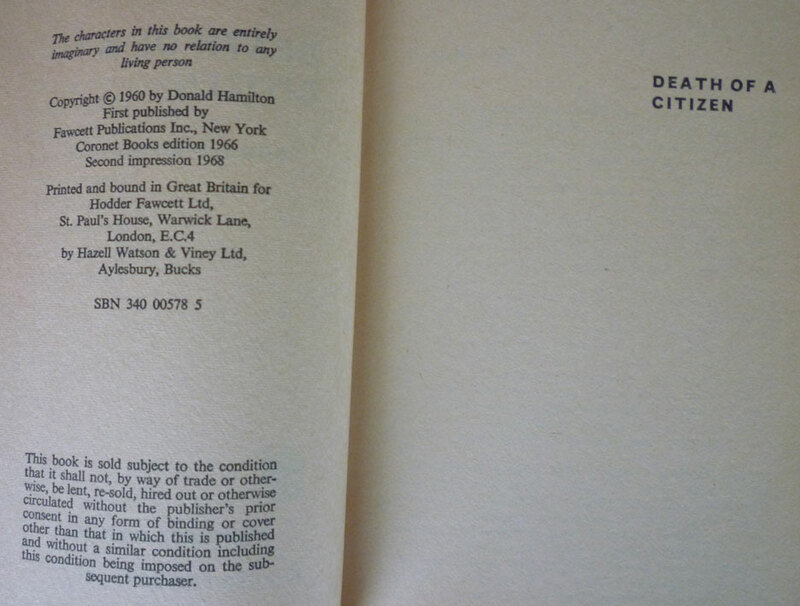 That said, the shift from the lighter, more easygoing aspects of the story – especially at the start – to its much darker latter stages is creeping and steady rather than sudden and swift. 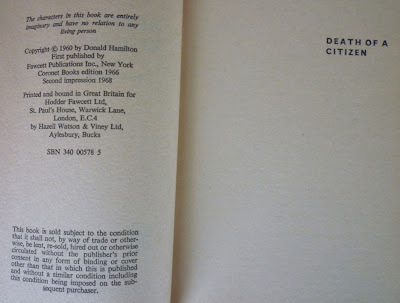 Hamilton effectively conveys Helm's conflicted response to his situation – his loosening grip on his everyman, family-man status versus his awakening homicidal urges and appetite for peril. 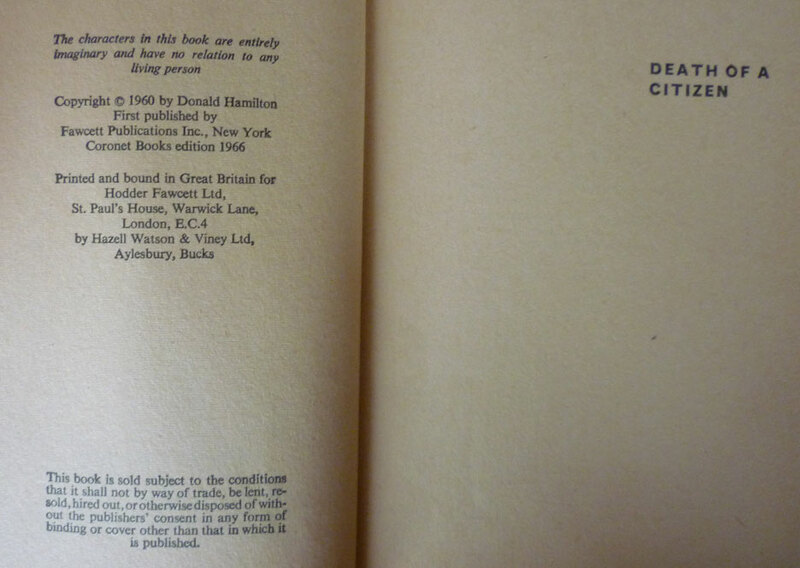 And of course, this being a spy thriller, nothing is quite what it seems. Two-thirds of the way into the novel there's a brilliant, jolting volte-face, leading to the kidnapping of Helm's two-year-old daughter; thereafter, Helm is set on a path of vengeance, from which there's no turning back. Matt Helm would go on to star in a further twenty-six adventures over the next thirty or so years – not to mention a series of films and a TV show. 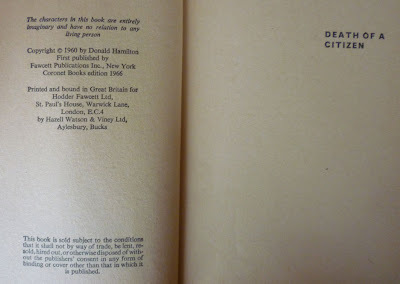 In this post I've showcased two Coronet editions of the debut Helm outing – the aforementioned 1966 printing, and the 1968 second impression. 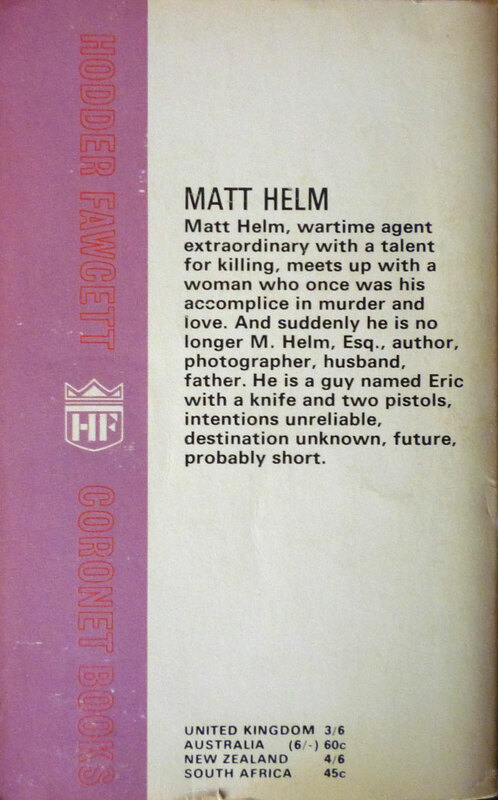 But Coronet wasn't the first British publisher to issue the Helms, and in the next post, I'll be examining the first UK editions of the next two Matt Helm novels – and the first US edition of the fourth one – as well as ruminating on some other aspects of Hamilton's career and Helm's publishing history.